This gasoline-powered hedge trimmer features a precision-trimming blade, reduced weight and increased fuel efficiency. 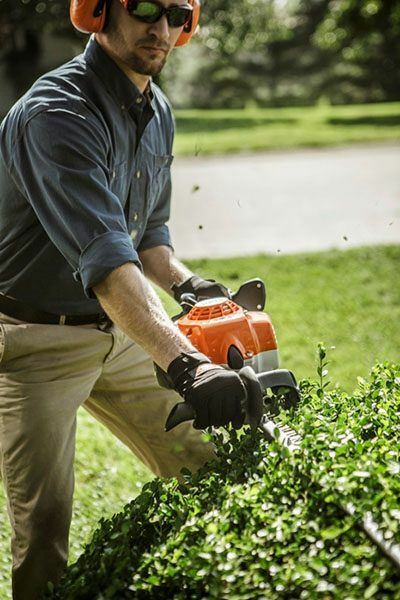 Precision and efficiency combine in the exceptional STIHL HS 87 T hedge trimmer. Available in 30-inch and 40-inch single-sided blade options, this trimmer operates at an increased speed (as compared to previous models) for efficient trimming of larger areas with greater precision. Its new low-emission engine uses 20% less fuel than previous models, reducing fuel costs and improving the bottom line. The hedge trimmer is also lightweight and includes low-vibration technology, so you experience less fatigue when you’re in the trimming zone.